The first tomato crusher was created in 1917 in Bologna, Italy, along the channel of Reno, the river which crosses the city and provides energy to power the town's factories. It was developed to have a quicker method to separate seeds and skins from tomato meat. The manual style and functionality of the first machine has withstood the test of time and the tradition continues to live through the Natural Classico Tomato Miller. You can feel in the weight of the Natural Classico Tomato Milling unit. Its body is made from cast iron just as the originals were. We have chosen to continue production in this material (as opposed to going to a cheaper aluminum) for longevity. When properly maintained, Natural Classico can be used for tomato production for years without worry of denting, misshaping, metal deterioration or other issues found with thinner metals. The Natural Classico does not entirely shun modern developments however. A pliable plastic is used for the bowl and the chute. Natural Classico intentionally selected red tones to hide unavoidable discoloration from the tomato juices; meanwhile, this plastic material can flex and bend without cracking. Additionally, the entire unit clamps down and adjusts to edge of a counter. 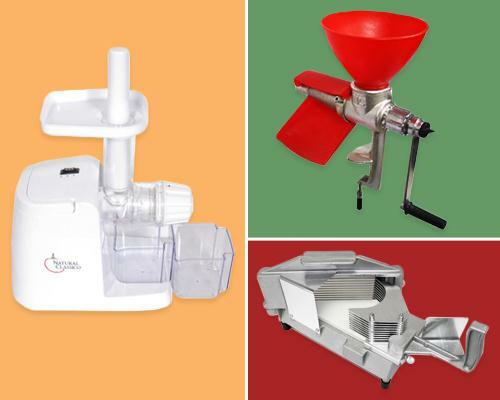 As a companion tomato processing product, the Heavy Duty Tomato Slicer helps achieve even and consistent slices of tomatoes (and other vegetables) in a fraction of the time! Forget about tediously slicing your tomatoes with those old, dull kitchen knives that squeeze juice all over your counter. This Heavy Duty Tomato Slicer makes the task much quicker and more efficient. Plus, it's easy to use - simply place the tomato or other fruit/vegetable in the body of the slicer and push the handle inward to slice. It will glide through 10 stainless steel blades to produce perfect slices every time. Constructed of a cast iron body and stainless steel blades, this unit packs a punch! The food grade plastic cutting board built into slicer ensures that all parts of the tomato make a clean exit out of the unit. Both the Natural Classico Tomato Miller and the Heavy Duty Tomato Slicer offer rubber stoppers on the base to avoid scratching your working counter. With Natural Classico we know these details make all the difference. This is a legendary machine in the canning industry. It has a long track record of high quality and is a great addition to our line of tomato milling products available. Its easy to clean white plastic and stainless steel design blends in with any kitchen decor. With society’s increased interest in organic and raw food cooking, the Natural Classico Electric Tomato Milling Machine is not just a juicer and miller, but a health food appliance. Our pestos and frozen desserts are extremely popular with today’s institutes and are now only a button press away. Great juicer for raw food cooking, healthy frozen desserts, fresh nut butters, outstanding baby food, and pureeing hard-to-eat foods.